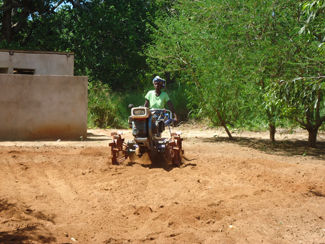 In late summer the improving and increasing diversification project which is involving 1,800 small farmers and their families in Cabo Delgado, Mozambique is finishing. The project has had two major areas: the first, linked to the improvement of production, while the second focused on boosting trade in surplus in local markets in order to achieve additional income for the community. The response and participation of farmers has been very positive, showing great interest in new agricultural techniques introduced and replicate in their gardens acquired skills in group work sessions in the model fields. To achieve an improvement in the quality and quantity of crops has worked in the water supply through the construction of 36 water tanks and pump wells 24 of rope. To facilitate the work of clearing the land, we have acquired 11 moto-hoes and have held several meetings to show how to use them. 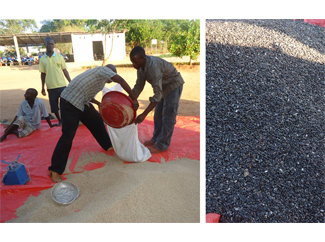 Also has been introduced food drying tunnels to facilitate preservation and subsequent consumption and marketing. Participating farmers have started growing sesame, sunflower, moringa and bamboo in order to have a greater variety of products. The efforts on improving the marketing of surpluses have concentrated first on training in business skills. It has also worked on the creation of farmer associations to manage their products, involving 26 Farmers' Clubs, and the implementation of a trade network that allows them to sell the products in the local markets at a time to direct them to other secondary markets. The project is funded by the Spanish Agency of International Cooperation for Development (AECID) and has the support of ADPP-Mozambique.